Most of you know what the wiccan rede is, however, have you ever stopped and read it in it's entirety and actually stopped to think what it specifically means and how it effects you? In this topic I will will be going over each line of the rede. Also note that this will be my wn interpretation of the Rede.. please feel free to add any further explanations if it means more to you. Now the first 2 lines are fairly simple. Stating that the rede is not just a council as the word rede means but it makes clear that it is a law of sorts. 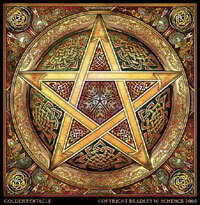 NOTE: Not all pagans and wiccans follow the wiccan rede. The second half meaning that you are safe and secure within your coven. To do any ritual inside a circle with another person can be an intimate thing. This simply means that when you enter a coven or are performing a ritual with someone it must be in perfect love and trust for there to be any effectiveness. For this reason a pagan community becomes very close with each other and are more often than not considered family. Give back as much as you are receiving as well as for everything you take from the earth you should replace it with something else. Do not be fake with your love. If you love then love equally, not only when it suits your own purposes. If you do not truely love then you cannot be truly loved. Be careful who you befriend. The fool reffering to anyone who wishes to do harm or act unwisely.You will be associated with who you befriend. If you are friends with fools you will be treated as one as well. You must learn and listen before you can teach. You, however, will always be learning. Nothing comes to you for free and you will be given what you deserve. Work hard and good things will come. Cause no harm whether it be emotional or physical. Not to others nor to yourself. Other than that do what you want. Deosil means clockwise and in general moving a circle clockwise is to draw in the positive. The waxing moon is when the moon is growing in size so this is the time when rituals for bringing positive things into your life should be done. Widdershins is counterclockwise and the waning moon is when the moon grows smaller and in general during this time rituals for banning negativity should be done. When the moon is full this is the perfect time to ask for you things you want and need. This one is pretty self explanatory referring to the 4 direction and earth elements and what their attributes are. this describes the 9 sacred woods and their uses and attributes. Remember in this stanza it makes very clear that the elder tree belongs to the Lady and therefore it should never be burned. I take this to mean something along the lines of how the tiniest stone can affect water this too applies to life, every detail has a reaction and can affect your path. This just explains the four greater sabbats that coincide with the seasons and what each one represents. This refers to the more minor sabbats that fall on solstices and equinoxes. In wicca three is a magickal number representing the 3 phases of the God and Goddess, the 3 fold law and in general things happen in 3. So it makes since that we would walk the circle three times when casting one. Be happy and do what makes you happy!